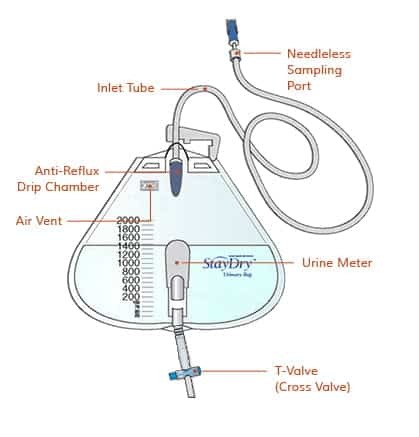 Looking for a Urine Bag or Medical Device manufacturer? 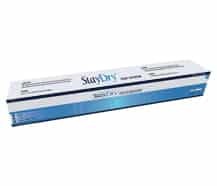 please INQUIRE WITH US to become an official StayDry urinary collection bag distributor. High Quality, Medical-Grade PVC material and components for absolute reliability. Hypo-allergenic for users with latex allergies. 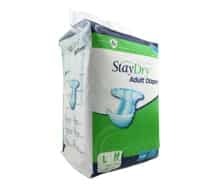 All StayDry Urine Collection Bags meet the highest standard requirements set by various regulatory bodies and as such are the collection bags of choice for major hospitals, clinics, senior living facilities and individual patients. StayDry Urine Collection Bags are the most reliable and trusted collection bags in the developing world. 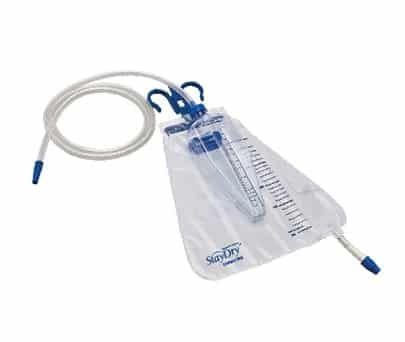 StayDry Urine Collection Bag (also called urinary bag or urinary drainage bag) is a medical-grade PVC bag attached to a catheter that collects and temporarily stores urine for those that suffer from urinary incontinence, urinary retention, or suffer from other health problems which affect the flow of urine. StayDry Hanging Drainage bags are large urine bags designed to retain large volumes of urine. 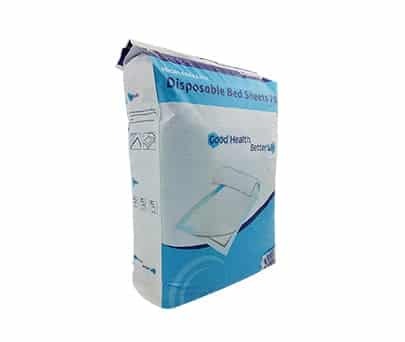 These bags are commonly utilized during the evening to provide a comfortable and convenient nights rest. 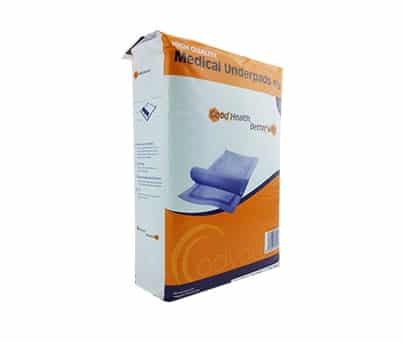 These bags are also suitable for patients who are immobile and confined to extended bed rest. StayDry Leg Mounted Bags are smaller bags which allow patients a high level of mobility in order to allow them to effectively manage day-to-day activities with ease of mind. StayDry Leg Mounted Bags are designed for maximum comfort and protection. 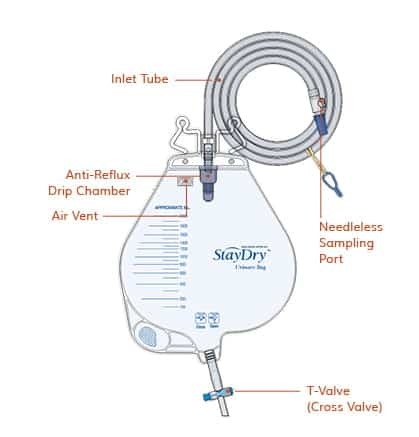 In addition, StayDry urine bags have an anti-reflexive push-pull valve, screw valve, or T-valve option, and come in multiple capacities to best suit consumer needs and allow our users to comfortably manage uncontrollable urinary problems. Our urine bags provide increased comfort and ease of mind compared to generic urinary collection bags, what is the StayDry difference? Our GMP, ISO, CE, and USFDA certified urine bags are of premium quality with their medical-grade PVC construction, 100% latex free materials, and EO sterilization. The risk of infection is an important risk to manage when the use of a catheter is necessary. The use of high quality of materials, rigorous testing and sterilization of our StayDry Urine Collection Bags is designed to minimize this risk. We understand that there may be any number of reasons you may require a catheter and that different people have unique schedules and require different tasks to be done each day. Flexibility is an important factor in leading a healthy and constructive life. To help you achieve this StayDry urine bags have a variety of valve, capacity, and bag type options in order to suit your specific urine collection and storage needs. 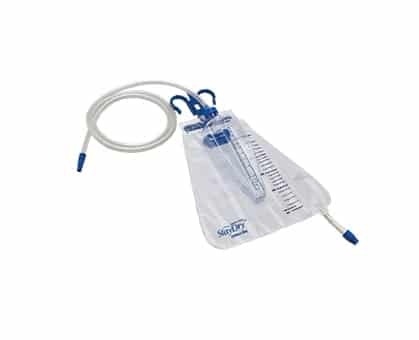 Urinary Collection Bags come in a wide range of capacities, valve, shapes, catheter types at differing costs and qualities. 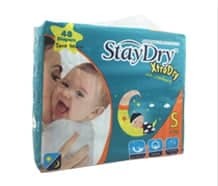 StayDry Urinary Collection Bags are engineered at a high standard for extended and rigorous use and assuming correct and proper sanitization procedures effectively reduce the number of bags required on an annual basis making your life more convenient and cost efficient. Why Use a Colostomy Bag? 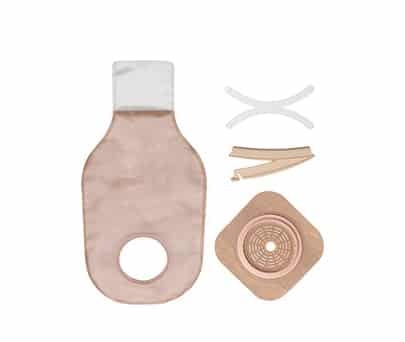 Colostomy bags are the best method to eliminate feces from patients who have undergone colon surgery, or have endured other relevant injuries. With our highly resistant CO-EX film, secure waterproof bag, and odor-absorbing filter our consumers can confidently and comfortably carry out every day activities while wearing a colostomy bag. 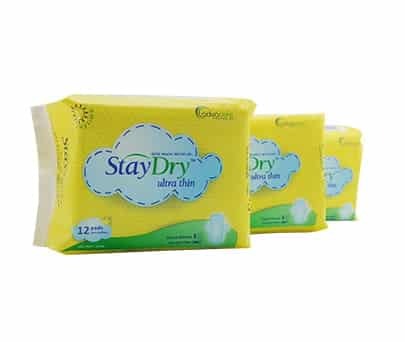 In order to effectively use StayDry Colostomy Bags, please refer to the changing instructions below. What is the difference between a one-piece and two-piece bag? 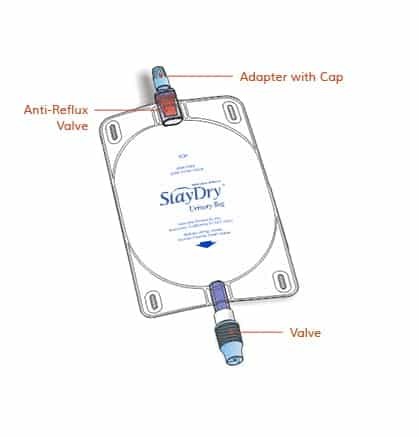 Our StayDry Colostomy Bag is a medical device that provides a means to collect waste for colostomy patients. StayDry Colostomy Bags are safe and secure with the advanced one-piece or two-piece pouching systems. The one-piece system combines the bag and the skin barrier in one device in order to provide patients with an easy and comfortable wearing and changing experience. The two-piece system allows the patient to conveniently change the bag without having to remove the skin barrier. Both systems are either drainable or for one-time use; prevent the patient from experiencing embarrassing leaks; and protect the surrounding skin from contamination. ISO, CE, and USFDA certified, these quality bags are waterproof, easy to empty, and made of a highly-resistant CO-EX film. For patients that are concerned about embarrassing odors, our bags have an odor-absorbing filter that reduces odor by releasing wind to avoid making the bag inflate. These advances allow for daily activities to not be interrupted with the use of a colostomy bag. 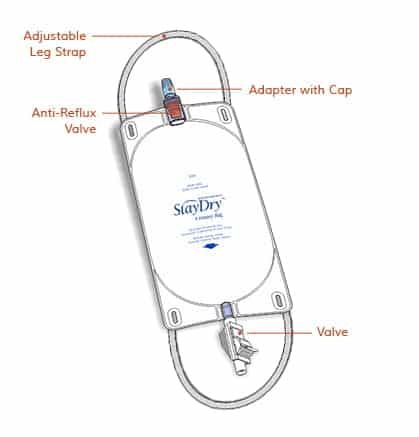 StayDry Colostomy Bags are also comfortable enough to be used in clinics, hospitals, or for home use. How to Change Your Urinary Bag? Your urinary collection bag should be changed once a month. However, if the bag begins to smell or has come into contact with a foreign object, change it immediately. 1 Wash your hands well for sanitary reasons. 2 Put the bag below your hip or bladder. Keep the bag in that position as you empty the contents. 3 Hold the bag over the toilet or professionally recommended waste container, open the spout at the bottom of the bag, and empty the urine into the toilet or container. Do not allow the bag touch the rim of the toilet or container. 4 Clean the spout with rubbing alcohol and a cotton ball or gauze. 5 Close the spout tightly. 6 Attach the bag back to your leg or hang it from the stand (depending on which bag type you are using). Do not place it on the floor! 7 Wash your hands again. Your urinary collection bag should be emptied at least two or three times a day, or when it is a 1/3 to a 1/2 full. What is the best way to keep my urinary bag clean? A: Please follow the proper cleaning instructions below. Wash your hands for sanitary reasons. Clean the used bag by filling it with a solution of 2 parts white vinegar and 3 parts water. Or you can use 1 tablespoon of chlorine bleach mixed with about a half cup of water. Close the bag with the cleaning liquid in it. Lightly shake the bag. How often should I clean my urinary bag? A: Clean the hanging drainage bag each morning and the leg-mounted bag each evening. Are StayDry urine bags reusable? A: Yes, our bags are reusable. However, please follow the appropriate cleaning instructions (Please refer to question 1). When should I empty my urine bag? A: Always empty the bag before it is completely full. 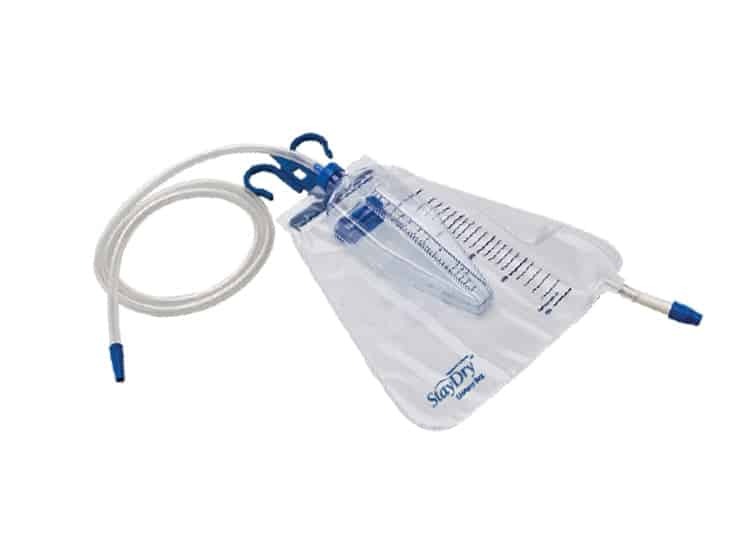 A full bag can pull the catheter tubing or even back up the urethra. Empty your bag at least two or three times a day, or when it is a 1/3 to a 1/2 full. When should I use the leg-mounted bag vs. the hanging-drainage bag? A: The hanging drainage bag should always be used at night, while sleeping. It should also be used if the patient is bed ridden. It is best to use the leg-mounted bag during the day. Can the leg-mounted bag be hidden when in public? A: Yes, the leg-mounted bag can easily be hidden. Ensure that the bag is lower than your bladder; this prevents urine from flowing back into it. Are there any risks when using a urine bag? A: A urinary tract infection (nofollow link to: http://www.webmd.com/a-to-z-guides/urinary-tract-infections-in-teens-and-adults-topic-overview) is the most common problem for people that use a urine bag. Urinary Tract Infections (UTI) occur as a result of poor sterilization techniques, If you start to experience symptoms of a urinary tract infection, please contact your doctor. You feel tired, experience muscle pain, and have a hard time focusing. Are StayDry urinary bags only for men? A: You can use baby powder in order to keep the skin dry in hot and humid climates.